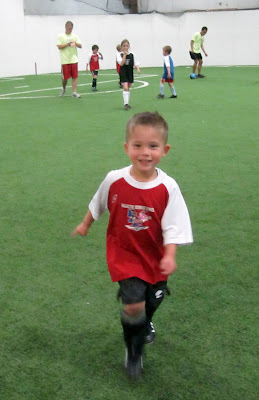 Today was Connor's last soccer scrimmage of the season. They had a special session today where they played 5 on 5 on a little field with the littler kids, 7 on 7 with all the kids, and then kids vs parents. As usual Connor had a blast. He ran constantly and worked hard the entire time. He wasn't nearly so timid today and although he didn't score any goals, he kicked the ball a lot more and got right in there with the big kids. He probably ran more than anyone else too. He was going full speed the whole time. We were a little surprised when Coach Shawn said that the parents were going to play soccer today, Andrea and I were wearing flip flops and couldn't go out to participate, but thankfully Uncle Nate stepped up and got out there to show everyone his stuff. He decided to be nice and "let" the kids score a goal on him. Thanks to Abby, Nate, Drew, Allison, and Grandpa and Ga for coming to cheer on Connor today! Big thanks to Uncle Nate for playing on our behalf!